While lots of my jewelry pieces can be changed into a color pattern that would suit a wedding theme color, or can be made in white or creme tones, some already have the right look. 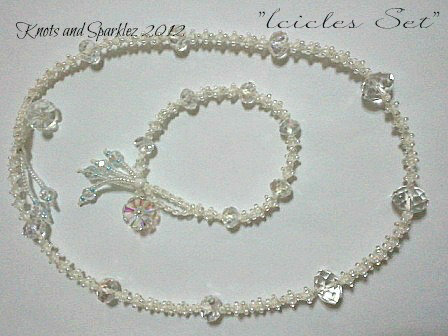 I have been told by some of my customers that certain pieces remind them of weddings. Some pieces are not suitable only for weddings but rather for all formal and special events, as Christenings, Communions, Confirmations, even Sweet Sixteens, or for Flower Girls. Here are some of those pieces. Beautiful and unique this Hair Clip was hand knotted with snow white macrame cords and adorned with pearl beads and silver accents beads with a few rainbow sparkle seed beads. It's made of swirls and leaves and hand sewn to a French Clip which is also covered with the same white cord. This is my own unique design. 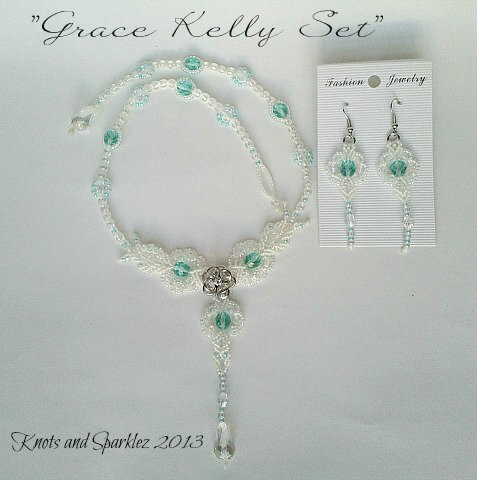 This set is displayed in white and aquamarine, although the white would remain the focal beads could be replaced with other colors, thus fitting your particular needs and likes. Earrings could be made shorter or slightly altered as well. Each piece can be altered to made unique. Size is an important factor as well, so each piece is made to fit your size of choice. Although in this instance fine metals were not used, it can be requested. If you prefer sterling silver earring wires for example, it can be accommodated. Price will reflect materials cost. 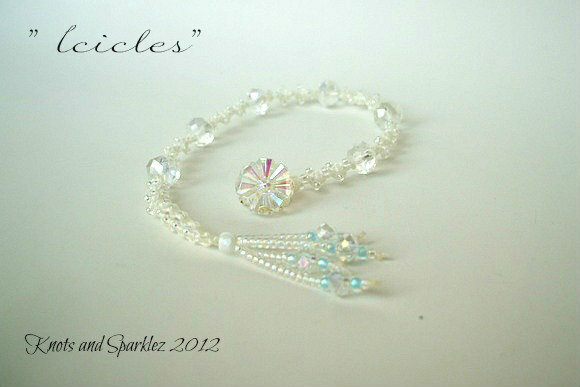 The "Icicles Set" is more subtle in its style, but still perfect for a simple wedding, or for any other formal event you may have to attend. It's sparkle is incredible especially when hit by light. The glass in the components has a rainbow finish that magnifies the sparkle even more. Again size is of importance so these type of pieces can be custom made to fit, and can be ordered and purchased separately. 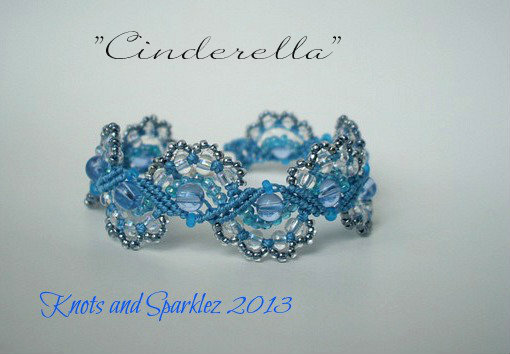 It would be perfect for a girl's communion or sweet sixteen, even for a prom event. 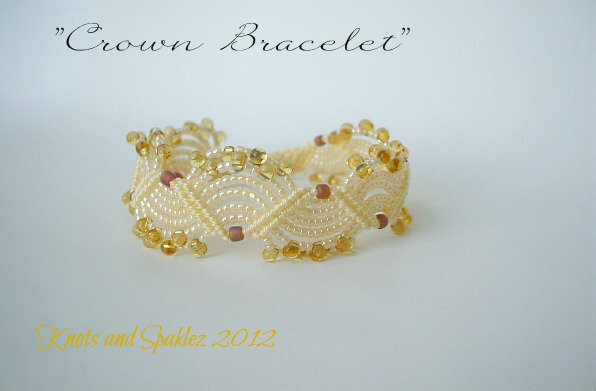 This is a bracelet I made a long time ago following a pattern I bought; I used my choice of color and finish to create something that looked elegant and feminine in a knot fashion. 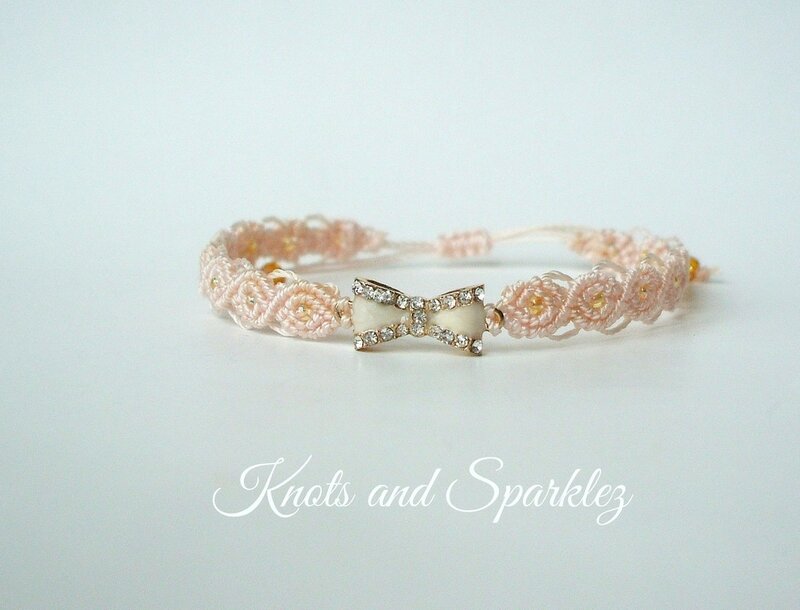 It has a bridal look and the beads are all pearlized, so it could be worn with a simple strand of pearls, or it could match the pearls on a wedding dress. Either way it is perfect for a wedding. 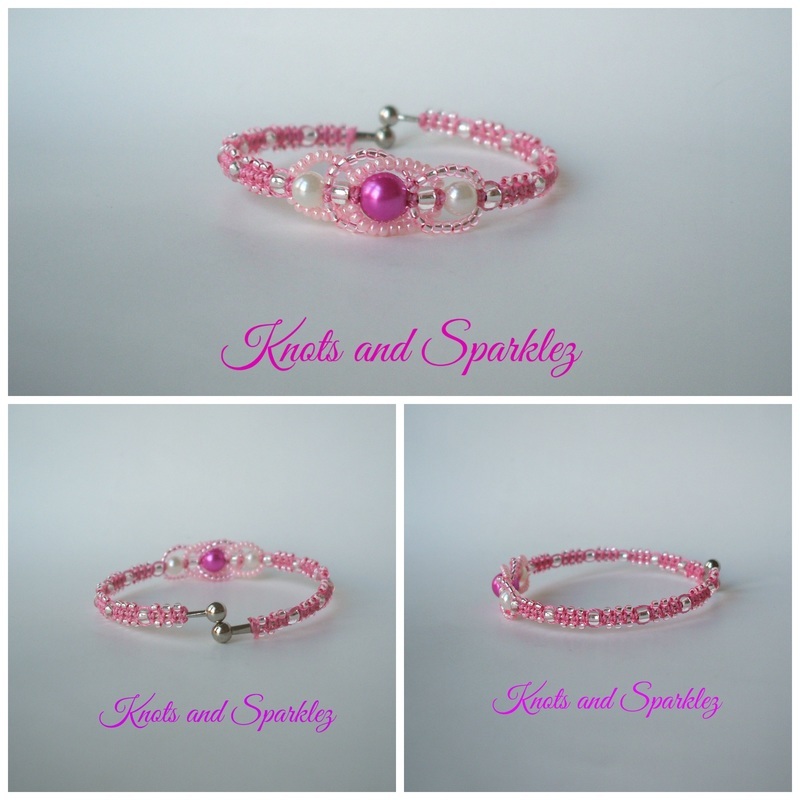 This can be also made to custom fit your size of choice and if requested clasp can be found in sterling silver. Prices will reflect choice of material. 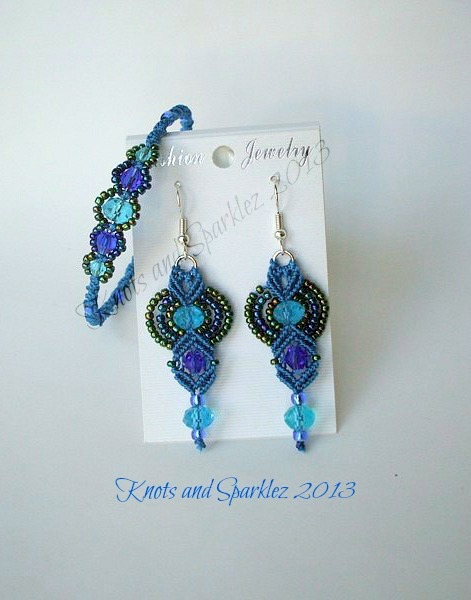 On the right you can see a pair of my BOMBAY earrings which uses some of the same materials and could be worn as a set. Hand knotted with high quality macrame cords and sprinkled with sparkly clear crystals with a rainbow finish, silver toned beads, and clear beads. 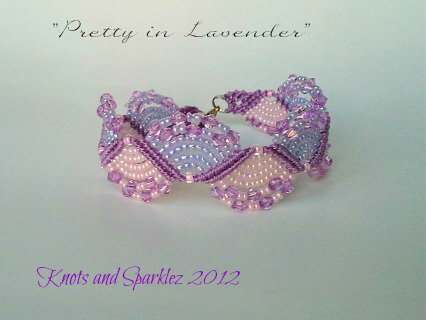 They have a slightly oval shape, are feather light and very feminine and elegant. 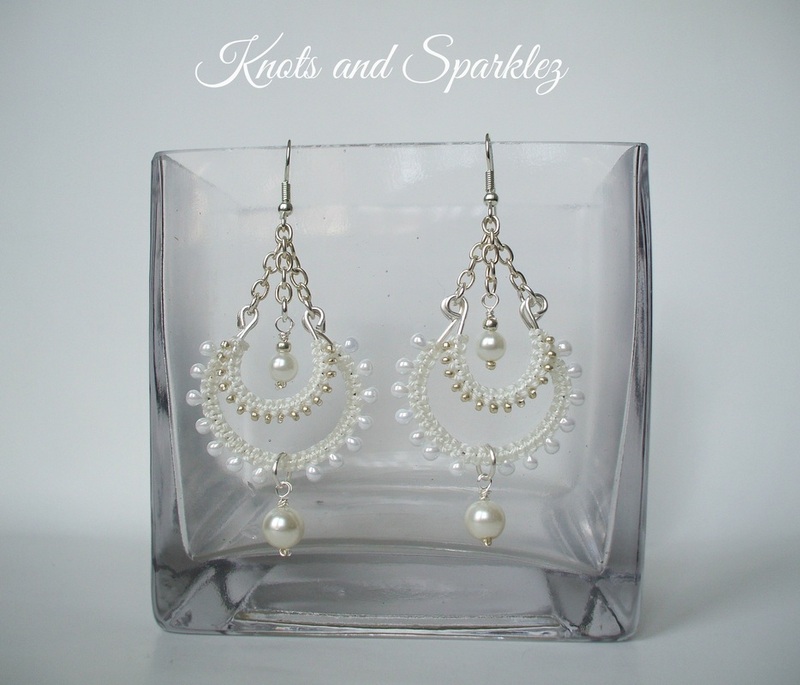 Perfect for a bride, bridesmaid or any other event, but they can be worn with semi formal outfits as well, particularly well suited for summer. Available also in pink and light blue. Not all weddings require white attire, especially if you are not the bride! These pictures display other colors typically suited for weddings and ceremonies, and could be well matched for bridesmaids, or weddings guests. They are all hand knotted, colors and sizes can be altered to fit your needs. The images above are just examples to show the infinite possibilities, choices and color variations. These are simple yet elegant and feminine bracelets that carries various messages, the Infinity Sign, or a Rhine stoned heart. 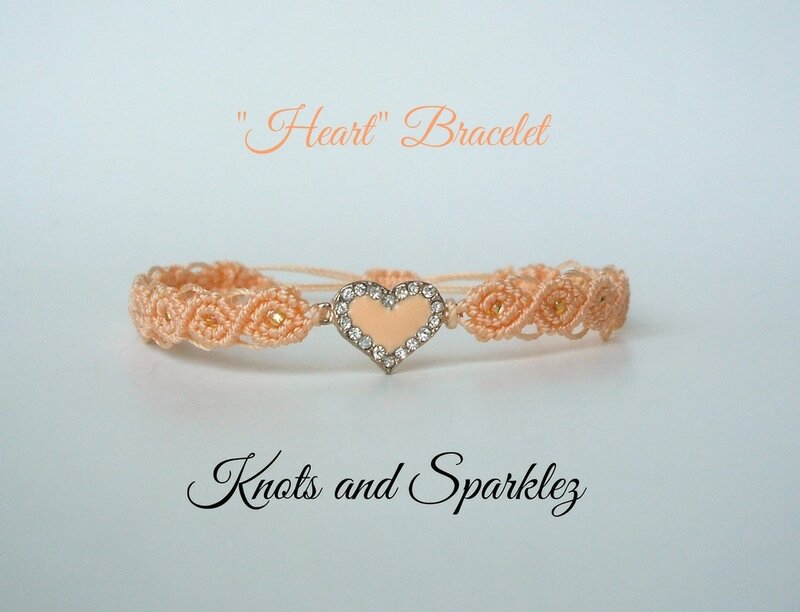 They make perfect gifts for your bridesmaids, flower girls, special circle of guests, or any other purpose you might have for your special occasion. They can match a particular dress color, and carry simple messages, and since they are 100% hand made they will make your gift recipient feel special and treasured!